Check out our Badlands, Kisan and Signal Dynamics Electronics. We now carry J.I.S. Screwdrivers. Go to our our home page and sign up to receive monthly discounts and product information. Click on Pictures or Title Bars for Product details. We are open Mon - Fri, 9am - 5pm EST. Closed Week-ends and Holidays. All Balls Bearings, Seals and Fork Bushing upgrades, are the best choice for the Motorcyclist, ATV extreme rider or the Dirt Bike aficionado. Air Wings for Gold Wing F6B motorcycles and trikes. Butler Cup- Kruzer Beverage Holder Systems, Accessories, Replacement parts. Affordable environmental protection for your powersports equipment. Don't let rain, acid rain, snow, hail, direct sun, fallen leaves, tree sap etc. ruin the quality appearance or damage your equipment. Hornet Electronic Deer Alert System with applications for Motorcycles, Automobiles and Trucks. Available in Chrome or Black Finish. Brakes, Rotors, Crush Washers, Oil Filters, Air Filters, Bolts, Push-pins, Speaker Covers, etc. J & M Corporation Headsets, accessories, antennas, mounts, cords and other products by J & M Corporation. The J.I.S. screwdriver is a must for anyone contemplating working on Japanese standard made products, such as Motorcycles, Power Sports Equipment, Remote Control Hobby Equipment, Telephone and Electrical Equipment! Headlight Modulators. Brake Light Modulators. Load Equalizers. Signal Light Cancelers. And More! Kuryakyn parts for: Harley Davidson, Honda, Suzuki, Victory, Yamaha. 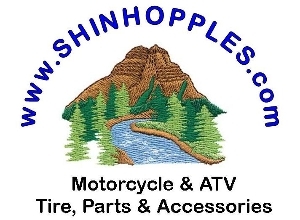 Motorcycle and ATV tire and wheel maintenance products. Tools and products to make your life safer and easier. Newest items carried by Shinhopples. OEM and Aftermarket parts for motorcycles, covering many models. Cleaning products for your Motorcycle, home or car. Plexus, Mothers, Bush, S100 and more. Shingrip, Foam Grip Covers, Various Sizes, Most Applications. Garage and shop items. Tools, chemicals and various items to make your maintenance shop a better place to work. Bargains on Clothing, OEM parts, etc. etc. The "Robinson" PTT Return spring for Honda GL 1800. This return spring is made available, so that GL 1800 owners do not have to purchase a $200 OEM PTT Switch module. This spring is not available from HONDA. A simple part, for a simple problem at a fraction of the cost. Flydanna Blue Rose Print Bandanna. Breast Cancer Hope. Head wrap, do-rag by Flydanna. Stop the itchy head, sweat soaked helmet syndrome. Breast Cancer Pink Ribbon Paisley Print. D0-Rag by Flydanna, US Army, Multi Print. D0-Rag by Flydanna, US Air Force, Multi Print. American Flag print Doo Rag. One size fits all.